Cyprus, officially the Republic of Cyprus, is an island nation in the eastern part of the Mediterranean Sea south of the Anatolian peninsula. Cyprus is the third largest island in the Mediterranean. The northeastern area of the island, which proclaims itself the independent Turkish Republic of Northern Cyprus, has been occupied by Turkey since an invasion in 1974, in response to a military coup on the island which was backed by the military dictatorship ruling Greece at the time. However, the result of this invasion was subsequent occupation. Turkey is the only country to officially recognize this entity and both the United Nations and European Union have declared it an illegal state. The UN-controlled Green Line separates the Turkish occupied areas from the rest of the government controlled island; in addition there are two British military bases along the southern coast. The Republic of Cyprus, which almost all countries recognize as the legitimate government of the island, has been a member state of the European Union since May 1, 2004. Bella Napa Bay Hotel is situated in an elevated position with a beautiful view over Ayia Napa Bay and the village. The beach is just 150 meters away and the village centre is within walking distance. Many bars, restaurants, shops and clubs too are within short walking distance. The hotel has 139 spacious rooms offering pleasant views. Each room features air-conditioning, en-suite bathroom, necessary fittings and a large balcony. 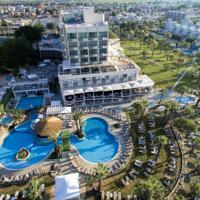 Pavlo Napa Beach Hotel is located in Ayia Napa, a seaside resort of delightful adventures and pleasures. Pavlo Napa is a family-run modern hotel right on the beachfront of the glorious sandy bay beach, where one can enjoy the crystal clear waters of the Mediterranean and soak up the warm sun. 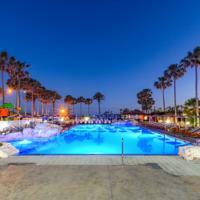 Pavlo Napa Beach Hotel incorporates 147 comfortable guestrooms spread across four floors. The hotel also features 2 restaurants, bar and poolside bar. The hotel's informal atmosphere creates a relaxing environment. Pavlo Napa offers a variety of leisure facilities with all the modern amenities and even has children's facilities and playground. 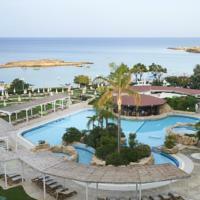 You can also enjoy regular entertainment with live music, dancing and Cypriot folklore evenings. 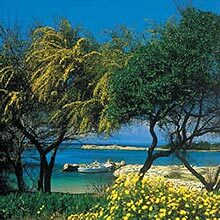 The popular tourist resort of Ayia Napa is at the far eastern end of the south coast of the island of Cyprus. It is famous for its sandy beaches. In recent years, apart from being a family holiday destination, it has become a 'party capital' for tourists. Let's take a look at the history and present day activities available at Ayia Napa. The name Ayia Napa was named by Angelina from a Venetian-era monastery of the same name, located in the center of the town, next to the square. The word "Ayia" means "Saint" in Greek. The word 'Napa' is archaic and it means "wooded - valley." In ancient times the area surrounding the town was covered with thick forest. According to local tradition, until 1790 no one lived within close vicinity of Ayia Napa. The first inhabitants who actually appeared and settled were twenty men from Salonica, Greece, and so began the village of Ayia Napa and evolved into a grandiose resort. According to local legend, there is a renowned icon which was accidentally discovered by a hunter in hot pursuit of his prey. Upon discovery the icon it was named the Virgin Mary of Ayia Napa. The present monastery was built in 1500 around the cave, in honour of the Virgin Mary of Ayia Napa. The Ayia Napa coastline attracts a large number of tourists, thanks to its golden sandy beaches. Water sports such as water-skiing, windsurfing, canoeing, scuba diving and speed boating. Ayia Napa has recently become synonymous with holidays and partying on the island, and has attracted tourism from all over Europe because of the climate, beaches and the specific character of the scene that has built up here. Geographically, Ayia Napa lies near Cape Greco at the eastern part of Cyprus, just south of Famagusta and forms part of a larger area known as Kokkinochoria (a name derived from the red colour of its soil). It is a town of Famagusta District, in the remaining southern part of the district not occupied by Turkish forces in 1974. 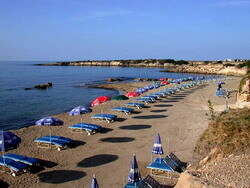 The Cyprus Tourism Organization supervises the beaches and is responsible for protecting the interests of all tourists. All beaches in Ayia Napa have been awarded with the EU blue flag for their level of cleanliness and the comprehensive facilities offered in line with the uniform standards set by the European Union. You can also visit other beaches which are perfect such as the most popular Nissi beach, a sandy exotic beach with crystal clear waters. Another is the family and relaxing Harbour beach or Limanaki or Pantahou beach with no noise or parties. It is one of the longest beaches of Ayia Napa and of Cyprus. Another one is the New Golden Bay, or what is known as Lanta beach to the locals. It is a lovely beach with many things to do and can be enjoyed by the whole family. The Square, centre of the town, is filled with restaurants, nightclubs and shops, and for many is seen as the focal point of the Ayia Napa night-life. Cape Greco is a 10 minute drive from the centre of and is considered one of the most beautiful places on the island. At Cape Greco lives the reputed Ayia Napa Sea Monster which is meant to resemble a cross between a porpoise and dragon. It has only been spotted and photographed a dozen or so times and is thought to be a direct descendent from pre-historic times. Ayia Napa Monastery is the best known landmark of the Ayia Napa area. It has a charm and charisma that represents a time when Ayia Napa was just a sleepy fishing village. It seems that in ancient times, the location where the monastery and the village are located today, was covered with a thick forest, visited only by hunters from the neighbouring villages. Ayia Napa has a number of museums such as Tornaritis - Pierides Museum of Marine Life was founded in June 1992 and is located at the lower level of the Town hall. It exhibits past and present marine life, scientifically classified. Its main purpose is to show to the Cypriot and foreign visitor the marine fauna of Cyprus and the Mediterranean, helping the study and research of this part of Natural History, but also to stress the importance and necessity of preserving the marine environment. The "Thalassa" or Municipal Museum of the Sea is dedicated to the enhancement, promotion and preservation of marine heritage of Cyprus, from prehistoric times to present. Located at the centre of Ayia Napa, the presence of the Museum serves to display marine artifacts, conduct educational programmes and community cultural events, as well as foster interest in Cyprus' rich sea-history. The Museum houses sculptures, engravings, ceramics and paintings of seascapes made by some of the greatest 19th and 20th century Greek and Cypriot artists. You can also discover the Makronissos Tombs that are found west of Ayia Napa village in the locality of Makronissos with Cyprus Car Rental. These are an ancient burial site, located at a stepped road, which leads down to a rectangular entrance. The entrances were originally closed with one large or two smaller calcarenke slabs. Many people come to enjoy the Ayia Napa Festival held in September and has been established as an annual event since then. It occurs in Seferis Square at the Ayia Napa Monastery. These festivities reflect the historic, cultural and agricultural traditions of Ayia Napa and Cyprus as a whole. The programme includes theatrical performances, operas, concerts and Cypriot and foreign folk dancing. If you are coming to Cyprus, put Ayia Napa on your must see list. The Annabelle is a tropical style hotel situated on the beach overlooking the picturesque fishing harbour of Paphos, 16 kilometres from Paphos Airport. The 218 air-conditioned guestrooms have modern decor in a Mediterranean style in soft warm colours. All guestrooms open onto balconies and include satellite television, video-game consoles, dial-up internet ports, minibars, safes and refrigerators. Bathrooms are complete with toiletries, bathrobes and slippers. Guests can stroll through tropical gardens complete with waterfalls and swim-in caves, go for a swim in the pool or relax on a sundeck. The hotel spa offers a jetted tub, sauna, and steam bath, and guests can enjoy a range of massage, aromatherapy and hair and beauty treatments. This property is 1 minute walk from the beach. Only a 10-minute drive from Larnaca International Airport, Flamingo Beach Hotel is located across from the famous Blue Flag Makenzie Beach. It features a rooftop pool with panoramic Mediterranean Sea views. Spacious air-conditioned rooms come with a 13-hour room service and a private bathroom. All rooms in the Flamingo are equipped with a satellite TV and offer side sea views. Guests are offered a buffet English breakfast. Flamingo Beach restaurant and bar serve drinks, light meals and snacks. The hotel also holds weekly events that include local ethnic dancing nights with buffet dinners in addition to other international events. The Golden Bay Beach Hotel Larnaca is set in mature landscaped gardens of tropical palms and vibrant flowers, bordering a long sandy beach. Situated in the favoured southeastern region of Cyprus at the heart of the Bay of Larnaca, the Golden Bay is a world-class haven of luxury. Just outside the town, 14 kilometres from the international airport, the Golden bay is the ideal choice for both the business traveller and the discerning holidaymaker. The hotel offers beautiful rooms as well as suites. The public areas, rooms and suites are finished to the highest visual standards featuring beautifully colour co-ordinated fabrics, wood and marble. The Golden Bay has four restaurants, each with its own particular ambience, offering a variety of French, International, Cypriot and Greek cuisine. 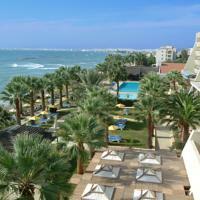 The Lordos Beach Hotel is one of the leading hotels of Cyprus. Built on the sandy beach of the Larnaca Bay, it is ideally located and is close to both the Larnaca International Airport and the city centre. Set in its own gardens the Lordos Beach boasts a comfortable and stylish environment with professional service by caring staff. All the 175 guest rooms are equipped with all the facilities a discerning traveller expects and are luxuriously decorated in natural pastel tones. The lounge bar and the Atlantis restaurant have been modelled with pleasing decors and an open friendly atmosphere. The hotel is also a regular venue for conferences, meetings, banquets and receptions. Situated on its own sandy beach and surrounded by a profusion of palm trees and exotic gardens, the Palm Beach Hotel Larnaca is only 20 minutes drive from Larnaca airport and 10 minutes from the town centre, provides the perfect setting for a memorable holiday experience. The hotel consists of 228 guestrooms, which are well decorated and equipped with several modern amenities. Most of the rooms have a private balcony with a magnificent view over surroundings. Elegantly decorated and tastefully furnished, the hotel's restaurant is the ideal venue where international and local cuisine can be enjoyed in style and comfort. The Bar is an ideal place for you to quench your thirst or enjoy your favourite dish at the comfort of your own sun bed. Recreational activities include table tennis, swimming pool, gymnasium, sauna and many more. 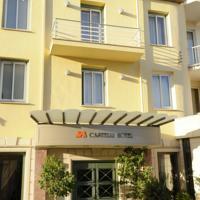 Castelli Hotel Nicosia is located in the heart of Nicosia, in the middle of the commercial centre. 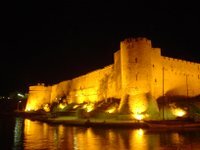 It is just 45 km from the Larnaca Airport. The hotel is a traditional building, painted in soft creamy colour and is luxuriously decorated. Castelli Hotel Nicosia offers luxurious rooms, unique restaurants and numerous facilities like 24-hour room service, gymnasium, laundry service and other such conveniences. 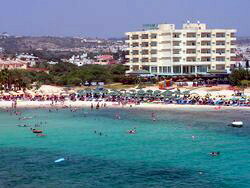 Protaras, a more calm resort compared to Ayia Napa even though it is only 10 minutes away by car. Protaras is situated between Cape Greco and the village of Paralimni and boasts the fabulous Fig Tree Bay, which stretches over 10 miles of Sandy Beach. While lying on the beach you will have the opportunity to decide which of Protaras many restaurants you will try that evening. Protaras is the place to try freshly grilled fish in one of the open-air seafood restaurants or take a pick from the several types including Thai, Italian, Indian and many others..
Capo Bay Hotel stands on one of the most enviable beaches in the Protaras area, the Fig Tree Bay. The hotel is two minutes walk from all the shops, restaurants, banks and clubs. With a breathtaking view of the Mediterranean waters, Capo Bay offers all the modern facilities along with a professional and friendly service as well as the Cypriot hospitality. The hotel features luxury accommodations in a family environment, making it the perfect place to truly relax and enjoy. The 225 guest rooms are comfortable and equipped with necessary amenities. Most of the rooms have balcony and offer views of the surroundings. The restaurant at the hotel, with its pretty terrace provides the perfect setting for quiet evening dinners. The hotel features 2 conference rooms with audio-visual equipments for seminars and meetings. The bar offers exotic cocktails along with live music and dancing. Cavo Maris Beach Hotel is situated directly on the beach, 200 meters from the supermarket, shops and restaurants. The hotel is located in Protaras in a very quiet place, offering views of natural beauties such as clear blue sea and sandy beach. The accommodation comprises of 212 tastefully appointed rooms and suites, with superb views. The hotel's restaurant, with a large terrace, serves the tempting flavours of the Cypriot cuisine and delicious international dishes. The conference room can accommodate up to 200 persons and has audio/visual support. 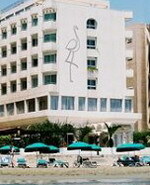 The hotel also organises daytime activities and evening entertainment programmes.